Kristy Martin Is After A Big Finish This October. A Long Awaited Big Finish. My life is divided into many categories: child, teenager, young adult, newly married, inexperienced parent, working mom, established community member (you get the idea). These areas are the result of the progression of time. Minutes, hours, days which continue to march on, despite what we do to prevent it. However, there is another major dissection of my life’s timeline: before and after my major weight loss. I am not alone in discovering that not only does one’s body change with a dramatic weight loss (mine was 120 pounds), but my overall lifestyle reflects the mindset I now have towards healthy living. I started slowly, walking 1/2 mile or so when I “had time”. With two young boys, I discovered that I never really “had” time, so I had to “make” time. I continued to walk, but still staying on our country road, afraid someone would see me. I had made progress, losing 40 pounds over one year, but then I got pregnant with our third, and then about a year later, with our fourth. With four boys under the age of 8, I knew in order to keep my sanity I needed to have a break. I took up walking once again and enjoyed the solitude (don’t get me wrong- I love my family but there was only so many times I could listen to the “Blue’s Clues” theme song or play “tractors and mud”). I took my first running steps in September 2004, 13 months after the birth of our fourth son. I remember walking as I had been doing for the previous year, but then wondering if I could run for a block. To this day I still don’t know what possessed me, especially since we had moved to town, it was daylight, and God forbid any of my high school students would see me. I ran for a block, and stopped. I was done. But I had ran one block. Over the course of a year, my one block spread into several, and eventually to six miles a day. Not one week, or one month, but one year. I reiterate this because I was one of “those people” who never thought I would enjoy running, but it took me at least a year before those words escaped my lips. I never entered any race until November 2010 when I registered for the 10 mile Turkey Trot. I “trained” (which meant I ran 10 miles once before just to make sure I wouldn’t pass out) and psyched myself to join the ranks of those who made a public declaration of their enjoyment of running (I know it was a race, but in my mind I just wanted to do it for the “experience”). But the night before the race, my then sophomore son was hit in a football game and suffered a concussion with complications. I spent that Saturday (November 20th, my husband’s 40th birthday) at his bedside rather than on the race course, but I was more grateful for his full recovery than crossing any finish line. My husband left for his year-long military deployment in January 2011. He didn’t know it, but one of my goals while he was gone was to run a marathon during that year. 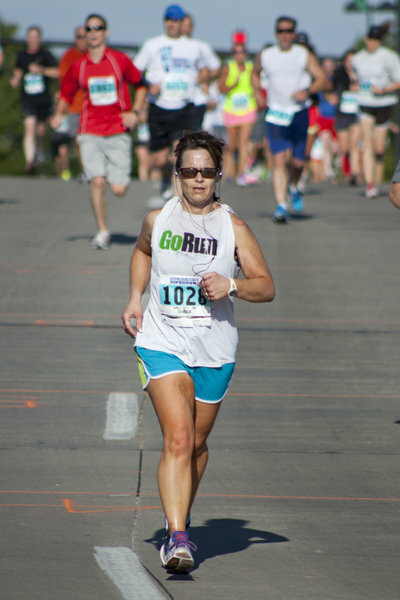 I ran in various 10k and 15k races, and eventually a half-marathon to help me prepare. I finally took the plunge and registered for the 2011 Prairie Fire full marathon. I registered early so I could both save money and make a solid commitment that I would not back out of. I trained (again, not for speed, but for the assurance I would be able to finish). I signed up for the early start time and was reassured by the note that those who were not to a certain mile marker by a certain time would be picked up (I thought about making reservations for that ride, complete with on-board lunch and a pillow, but I didn’t want to seem presumptuous). I made it to September, up to my 14-mile run, when I felt it. The first twinge that every runner experiences once in a while but chooses to ignore (and many times it goes away). This one was in my right calf. I finished my run, iced and took ibuprofen, and went out the next day. And repeated. And repeated. And repeated until my Sunday morning 12-mile run. I felt it tear. I fell down on the deserted country dirt road and I cried. I always carried my cell phone on long runs, and I called my oldest son. After giving him directions on exactly where to find me, I cried while waiting for him to pick me up. I limped around for a few days, figuring a few days of rest would help. I tried running a week later, but it was still there. Our high school has an athletic trainer who comes once a week, and I asked if he could take a look at it. He could feel the indention, although it was small, and he tried to look as sympathetic as possible when i asked him if I could run a marathon in three weeks. No. I took six weeks off, knowing I had to. I hated it. I did go pick up my race pack with my bright yellow t-shirt, but I didn’t get one of those cool finisher ones. I finally decided to quit feeling sorry for myself and resolved to “come back” (even though I wasn’t really there) next year. So here it is, next year. My husband was gone a total of 18 months, and now that he is back he will be cheering me on (from the crowd- I still haven’t convinced him to join me… yet). Why do I run? I do it for me. Of course it helped me lose my weight, but more importantly it gave me confidence. I am definitely not the fastest, nor do I want to be. I take pride in knowing that I am strong both physically and mentally, set a healthy example for our boys, and did not back down from the challenge I set for myself. I see the 2012 Prairie Fire marathon not as an opportunity to win prize money or accolades, but for me to see what I can accomplish for myself. I guarantee you I will be drenched in sweat (no matter what temperature it is outside), halfway incoherent, and looking for the nearest bathroom, but I will make it to the finish line – even if it means that I turn down a ride to get there.